President Donald Trump will round out his first week in the White House on Saturday with phone calls to the leaders of Russia, Germany, and France, according to White House Press Secretary Sean Spicer. That means Trump will be living out his campaign trail prediction that he may have to "deal with" German Chancellor Angela Merkel, who Trump called his favorite world leader and the woman he accused of "ruining Germany." How the two will work together remains a point of intrigue considering how Trump spoke about Merkel during his campaign. The then-candidate repeatedly lambasted the German chancellor for allowing refugees from war-torn regions into Germany, blaming her for what Trump described as the ruin of her country and using her policy as a jumping off point for his own anti-refugee proposals. At a November 2015 rally in Knoxville, Tennessee, Trump said that what Merkel did to Germany was "a disgrace." Trump admitted that he used to be a "fan of Merkel," but changed his mind after her decision to allow refugees into Germany. Trump continued the Person of the Year complaint at a campaign rally weeks later in Grand Rapids, Michigan. "They gave it to a woman who's not done the right thing in Germany," Trump said in December 2015 before leveling a prophecy that would be true a year later. "Nice woman, I like her, I like her. I better like her, I may have to deal with her. Look, Putin likes me, I want her to like me too." While campaigning ahead of the Iowa caucus, Trump predicted to a crowd in Cedar Falls that "the German people are going to end up overthrowing this woman. I don't know what the hell she's thinking." "Germany's being destroyed," Trump declared in a March 2016 interview with the New York Times. "I have friends, I just left people from Germany and they don't even want to go back. Germany's being destroyed by Merkel's naïveté or worse. But Germany is a whole different place and you're going to have a problem in Germany." Trump again reiterated his reversal on Merkel to NBC News' Katy Tur in June 2016. Asked about his less-than-complimentary statements about Merkel, Trump responded: "I gave her great compliments until she allowed the refugees to come into Germany, and Germany ... has tremendous problems right now." In the heat of the general election, Trump tied his opponent to the German chancellor. "[Hillary Clinton] is running to be America's Angela Merkel," Trump's scripted attack read at a September rally in North Carolina. 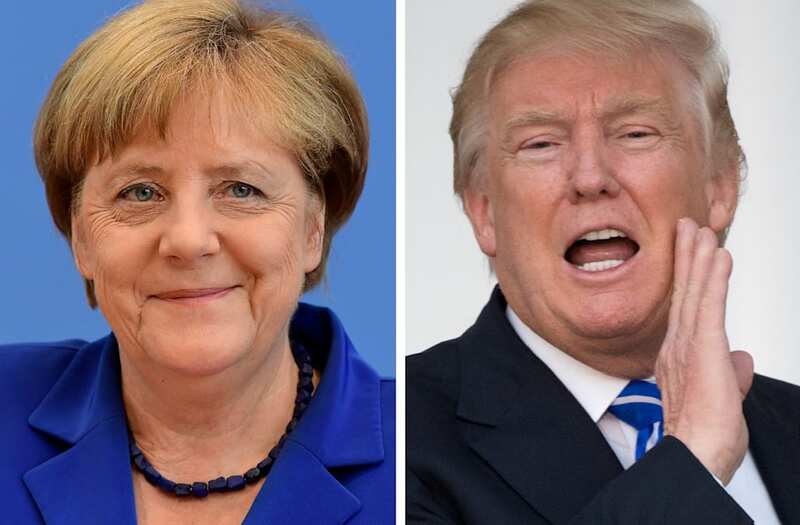 Trump called Merkel his favorite world leader, confusing many who had heard him lampoon the German chancellor for months prior: "Well I think Merkel is a really great world leader but I was very disappointed that, when she, this move with the whole thing on immigration. I think it's a big problem and really, you know, to look at what she's done in the last year and a half. I was always a Merkel person. I thought, really fantastic, but I think she made a very tragic mistake a year and a half ago." Days before his inauguration, Trump told the Times of London he believed Merkel's decision to allow more than 1 million migrants into Germany a "catastrophic mistake."